Doing the Seated Lunge Technique can help you right away, anytime. If you have to sit all day, practice this exercise. It’s easy and will make a big difference. 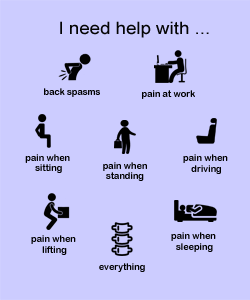 Need immediate help because it hurts to sit? Start these 5 At Work Tips now. If you’re stuck having to sit for long hours at work, you’re going to need to protect your back. You can only sit for so long before it can become a common and chronic source of stress and discomfort. Not only is your lower back affected but your hips are affected as well. It’s important not to allow this bad habit to affect your health. Whether it’s from sitting at work or from driving long distances, virtually all of us suffer from this painful condition. It is important to understand that although you ‘feel‘ rested while in the seated position, your spine is NOT actually in a restful state or position. Sitting allows you to relax almost all of the muscles of your body except for the ones that keep you from leaning over to the side and forward. The pressure on your lumbar discs is much too high in this position. When you sit this way, the muscles that stabilize the lower back, hip and pelvic area will lose any support. The spine therefore relaxes and forms an excessive curve unsupported by your surrounding primary muscles. The entire weight of your upper body places unbalanced pressure on the spine and the discs. The muscles that are meant to support the lumbar area then become overstretched and fatigued (potential for constant back spasms). Your discs become unbalanced and risk bulging (risk of herniation or degeneration). The pelvis ‘unlocks’, and its tilt loses neutral position (potential for disc injury). All of this while at ‘rest’. For more detail, please read this article on Pain when Sitting. Lunge and sit at the same time! Anyone can do it and you’ll notice an improvement right away. Exercises (See Table of Contents). Stretch your psoas muscle (common area for lumbar pain). 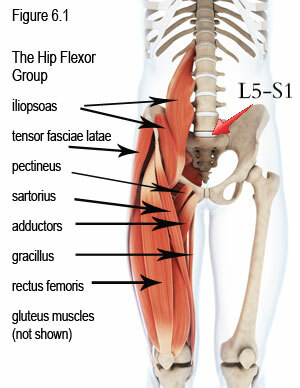 Stretch your rectus femoris (thigh to reduce anterior pelvic tilt). Strengthen your glute muscles (vital for lumbar support and protection). Strengthen and condition your back muscles (upper and lower to help maintain a neutral spine, reduces back spasms). First of all, it is important to LIMIT the amount of time you rely on your seat and to take breaks from extended sitting (every 25-30 minutes for 1-2 minutes). Standing or walking is a must. Remember: Sitting is NEVER healthy for your lower back. Step 1: Sit upright with one leg and buttock fully ON the seat and the other leg and buttock suspended OFF of the seat. Keep both knees bent with your feet flat. Step 2: With the unsupported leg, slowly slide it to the side and behind you until you are fully stretched out as comfortably as possible. Hold the chair rest or table for stability. Step 3: Try to extend the leg behind you by contracting your thigh muscles and hold this position for 1 minute. Step 4: Repeat this exercise with the other leg. Note: You may find yourself leaning forward as you extend the leg behind you. Try to avoid this by extending less and maintain an upright posture. Remember, you want to utilize your legs more while your spine is in neutral posture. Tip: Contract your abdominals to help counter any excessive anterior pelvic tilt produced from extending your leg behind. Performing this movement often during times of extended sitting helps to correct the posterior pelvic tilt that sitting leads to. 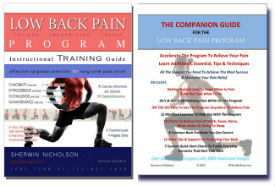 I have developed a very comprehensive and easy to follow guide to help you overcome the pain. Although it requires a lot of commitment, it is worth the time and effort because it is you who learns everything you need to know to recondition your body to help you. I am ready Sherwin, where do I begin?